An engraving of a reindeer in a South Wales cave could be among the oldest rock art found in Britain. An analysis completed on July 27th, 2011 dated the image at around 12,600 years old, though it could be even older. The engraving was discovered by archeologist George Nash from the University of Bristol while visiting the cave with a group in September 2010. 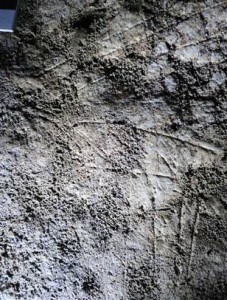 Although the engraving is difficult to make out, the presence of antlers indicate it is a reindeer. Reindeer have not been found in Britain since the Upper Paleolithic, 40,000 to 10,000 years ago. The exact location of the engraving is being kept secret to prevent vandalism, as the cave located on the Gower Peninsula is publicly accessible. During an excavation at the cave in the late 1950s, flint tools were recovered. They may have been used to create the image. The research is being conducted by Nash, as well as with researchers from the Open University, the National Museums Northern Ireland, the National Museum Wales and the Welsh historic environment service Cadw.